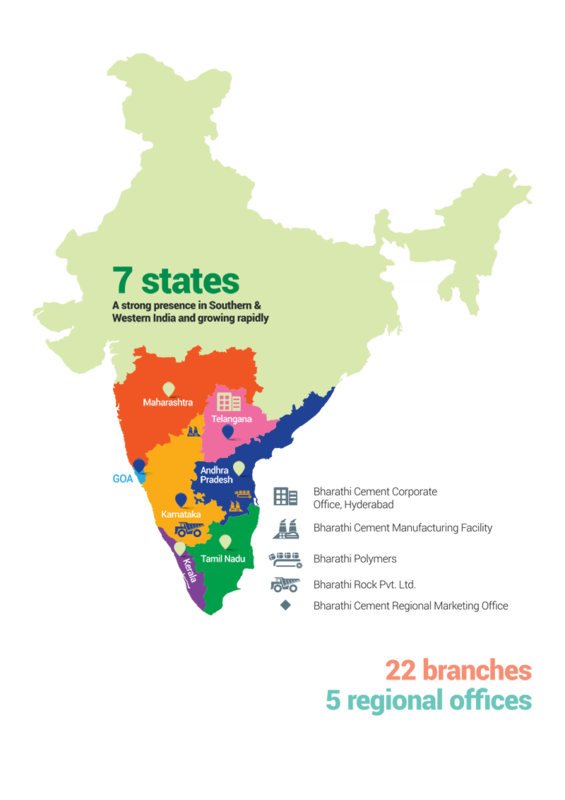 Vicat in India functions in 3 verticals - Cement, Aggregates and Polymers with a team of over 850 professionals and operations spread across 7 states in India. Bharathi Cement is the flagship brand of Vicat Operations in India. Vicat, France is the pioneer in cement manufacturing since its invention by Louis Vicat in 1817. The group operates in 11 countries with business interests in Cement, Ready-Mixed Concrete, Concrete Product (Precast) and Aggregates. In 2010, Vicat Group bought 51% majority stake in Bharathi Cement Corporation Private Limited. Bharathi Cement made a mark in the Indian Cement Market by creating a niche for itself in the premium segment. Partnering with Vicat, France led Bharathi Cement reach a strong position in the market and a cement brand to reckon with. Vicat In India operates with 2 cement manufacturing companies with a single brand Bharathi Cement” ensuring operational synergy. The company owns the state-of-the art manufacturing plants in Kadappa and Kalaburagi with a combined production capacity of 7.75 MTPA. With its state-of-the-art processes, committed teams, efficient delivery and a strong distribution network of over 3000 dealers, Bharathi Cement is a leading cement company of the Southern & Central India with headquarters in Hyderabad. We continue the legacy of Louis Vicat with the same dedication, sincerity and hard-work. Awarded Asia’s Most Promising Brand for the year 2013 and 2014.